For the past month or so, I have been living in denial. Big time. I didn't realize this until I missed an oncology appointment on July 18. I basically just blew it off. I had something going on at work and completely "forgot" about my doctor appointment. If that isn't denial, I don't know what is. And here's another clue that I am in denial. I am still eating meat and drinking wine just like I was before my diagnosis. In my head I know that I need to cut out the acidic animal products and alcohol. I know that I need to eat more veggies and drink green juices. I even have a $200 Breville Juicer collecting dust on a shelf in my kitchen. After all that I have been through, why am I behaving this way? According to Wikipedia, denial is a defense mechanism "in which a person is faced with a fact that is too uncomfortable to accept and rejects it instead, insisting that it is not true despite what may be overwhelming evidence." 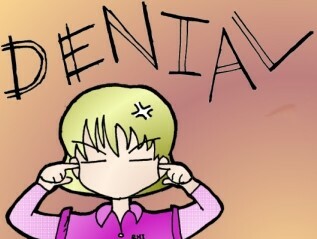 There are three types of denial: simple denial, minimization and projection. I definitely fall into the category of minimization which is admitting a fact ("Yes, I had breast cancer.") but denying its seriousness ("It was caught early. I had chemo. I feel fine. I will be fine..."). The truth is, I had breast cancer. And if I want to avoid a recurrence or another breast cancer, I need to pull my head out of the sand and get serious. Exercising at least 3 hours per week. Drinking green juices every day. Catherine - Thank you for being the first to follow my new blog! I hope you are recovering from your recent reconstruction surgery. Yes, a long road ahead for sure but I think the worst is behind us. Mandi - Hi there! Thanks for following me over here. We are not at 29 years yet - just celebrated our 23rd wedding anniversary. As I was writing my anniversary card to my husband, I told him that now I understand what "in sickness and in health" really means. Evelyne - Girl! How are you? I hope you are doing well and enjoying life. Thanks for stopping by to leave me a comment. How do you like my "Comments on Comments" section? Does it look familiar? haha! Liz - Thank you for finding my blog. I just popped over to read yours and yes, we do have some similarities in our breast cancer experiences. You look wonderful with short hair! I hope you are feeling well and taking your tamoxifen every day. I will continue reading your blog to get caught up. Life is too short to not eat butter, and drink wine... ;) I try to exercise and eat at least 5 servings of veggies. I figure that makes up for the rest of it right?